Welcome back for part two of my talk with David Neeleman, founder of JetBlue and now current founder and CEO of Azul in Brazil. Yesterday in part one, we talked about starting up an airline in fast-growing Brazil, and some of the challenges involved. Today the focus is on the airline’s fleet choices. It opted to start with the smaller Embraer 190/195 aircraft and has now just announced an order for ATR turboprops. This is different from what JetBlue did, and the rationale behind it makes a lot of sense. (You can see part 3 on his thoughts on JetBlue here.) Let’s continue. Cranky: I’m curious about the fleet choice. You started with the Embraers. I assume it was a conscious decision to go with a smaller gauge than you started with at JetBlue? market was being served in a lot of big markets. And we couldn’t get in to the big, the filet mignon, they call it, Conghonas in São Paulo, so we thought well, what’s the best strategy? It was to go between cities with no nonstop service. Of the 22 markets we fly, in 16 we’re the only nonstop. And the others, with one exception, we’re the market leader. The interesting thing about the Embraer 195 is that our trip cost is about 35 to 40% less than those guys are. So that means you can actually be making 15% to 20% on a market and they could be losing 20%. We have higher RASM [measure of unit revenue] than they do. Even though our average fares are less. For example, we had in May an average fare that was 30 Reais [about US$17] less than they had, but our RASM was 20% higher because we had an 85% load factor and they had a 58% load factor. Cranky: Was part of the decision with the Embraers also a political aspect? Choosing a Brazilian-made plane? David: That was just the frosting on the cake. We would never have done it just for political reasons, but having that advantage, we’ve certainly made the most out of it. Now with the ATRs come along. . . .
Cranky: Yeah, I was going to ask about that. David: There are a lot of cities that just don’t have service, period. So we’re going into a bunch of cities in interior São Paulo that either have 1 or 2 flights a day or none. We give them good service, we’re kind of doing to ourselves what we did to the other guys. Because the ATR has about a 40% lower trip cost and about the same seat cost, which is astounding. The reason for that is that turboprops burn a lot less fuel and the cost of fuel in Brazil is about $1 more than in the US. Cranky: With the ATRs, I looked at that and said, ok, you’re clearly not going to look at Embraer. You could have gone to an Embraer 170 if you were just concerned about the seats, but from a cost perspective that’s not a cheap plane. David: Yeah, people like jets but jets just burn a lot more gas. An Embraer 145 with 50 passengers burns twice as much gasoline as a 70 seat ATR. Cranky: Yeah, that’s why nobody wants the 50 seaters anymore. Cranky: I’m assuming you also looked at the Q400 so what was it about the ATR? David: It was a couple things. The Q400 offers two advantages – it’s faster, flies about 50 knots faster [Cranky note: ATR says the ATR 72-600 max cruise speed is 276 kts while the Q400 is 360 kts] and it carries 6 more seats at the same seat pitch. The first hour doesn’t really save you that much with the speed. Most of our flights are 1 hour or 1.5 hours so it was not a big deal to us. And the Q400 weighs 10,000 lbs more than the ATR [Cranky note: Operating empty weight for the ATR 72-600 is 28,682 lbs and for the Q400 HGW is 37,888 lbs] and burns about 30% more fuel. We didn’t need the speed, we didn’t need the seats, so why would we spend 30% on gas? For us, it was really a no-brainer to go with the ATR. 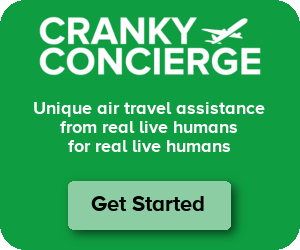 Cranky: With the ATR, are you treating it as the same type of experience onboard or is more of a traditional express type of service? David: Well, it’s a very short flight. The average stage length is under an hour. I’m not going to put LiveTV on those planes. We’ll have that by the end of the year on the Embraer 195s. There’s 2/2 seating, leather seats, good seat pitch. Comfort issues will be the same as what we have on our 195 fleet. We just won’t have in-seat TV sets. Cranky: Back to the Embraers. I know there were teething probelms with JetBlue in terms of dispatch reliability. Have those been worked out? David: Every single plane has kind of a break-in period. We’re finding that the dispatch reliability on the 195, and that’s our bread and butter, every plane has its little idiosyncrasies, but we’re really happy. We’re flying them 14 hours a day and our dispatch reliability is over 99%, so we hardly ever canceled a flight due to maintenance. Cranky: 14 hours a day? David: Yeah, 13 or 14 depending upon the month. Cranky: Wow. So you’re continuing this rapid growth path here, right? David: Yeah, I mean whenever you have an opportunity and a market, to make sure you get established and have economies of scale. . . . There’s a wide open market in Brazil and we’re taking advantage of it. And that’s it for part two. As I mentioned, come back tomorrow when we talk about what David thinks is wrong with JetBlue and what the airline needs to do to fix it. He was quite a ways off on those Q400 numbers. Sounds like Neeleman never actually talked to Bombardier. Those figures sound exactly like what ATR would say about it’s competitor. In fact, that is a loaded statement because a friend from Azul’s fleet planning told me that Bombardier was never even invited to compare. Perhaps it has something to do with being in Embraer’s back yard. i’m not sure i agree. the only factor that he was off on was cruising speed which, as pointed out, would not be much of a factor on short flights. it seems clear he was looking for the plane with the lowest cost to operate. I’m no expert, but I suspect he was pulling round numbers from the top of his head, and I think they were in the ballpark. Yeah, I don’t think he was that far off, actually. I was just adding numbers in there to give a little more specific info, but it’s within the ballpark. Now, I don’t know about fuel burn. Maybe someone else has that info, but it would stand to reason that a plane that weighs 10,000 lbs more would burn more. Maybe they didn’t talk to Bombardier formally because they already knew the answer. At least they are smart enough to know they need another type aircraft to serve other markets to not always do what every one else is doing. And if they are going to serve markets with little or not traffic, the public will be happy to have air service and not care that it’s a turbo prop. get his take on X-Jet’s now defunct branded operation, given that’s what they seem to be doing in Brazil. except x-jet was trying to do it with 50 seat RJs that burn 2x as much fuel as the 70 seat ATR props azul is using. it is the same idea (nonstops to underserved markets) but with VERY different execution. in fact, x-jet and indy air only tried that model because they had nothing else to do w/ dozens of extra 40-50 seat RJs. most, if not all, agreed at the time that the model might work but the a/c used were the wrong type to make it work. I think Bill’s right about the 50 seat RJ. That’s a big difference. But the other big different is that ExpressJet was connecting the dots in cities that had plenty of service, just not between each other. It sounds like much of what Azul is doing is serving airports that just don’t have much service at all. So it’s a different story. What Neeleman says is actually spot-on. The ATR is indeed cheaper, also in terms of maintenance. Nevertheless, there also some things which he seems to ‘avoid’. Yes, 16 of the 22 routes Azul currently serves are only served by them. And yes he will continue to build on routes which only Azul will be serving. Anyhow, traffic is increasingly rapidly and on certain flights nowadays there and he is effectively building a main hub and several (regional) mini-hubs which are connected to each other. His trunk routes are packed and he is running out of slots at his hubs. At some point it will make sense to get a larger airplane… My gut tells me Azul has already made a decicision on the subject and is just waiting for the right time to make the annoucement. I just realized that our talk about bigger airplanes is going to be in tomorrow’s discussion. Sorry about that – got added in at the end of the conversation. Viracopos/Campinas is the big hub with the rest pretty minor, right? Viracopos has only 1 runway, but it’s plenty long and there are still very few flights per day there. I looked for today, and there are only 69 departing commercial flights all day with a handful of cargo too. So let’s say the runway needs to handle 150 flights a day. That’s easy. So why would they be running out the slots? It would seem there’s plenty of pavement for a lot more expansion. They just need facilities to be built. Well, let’s put it like this, VCP is becoming crowded as we speak and the problem isn’t really the runway, but the terminal. As a matter of fact, most of Brazil’s airport-capacity-related problems are in terms of terminal capacity: there simply isn’t enough space to park the airplanes at one time. Furthermore the passenger terminals are also completly packed… According to a recent study, VCP will be completely clogged by 2014, just before the start of the WorldCup. Additionally, according to the same study, Azul currently already serves airports which are in a chaotic situation. These are: CNF, BSB, POA, CWB, SSA, FOR, CGB, NAT and SDU. CNF, POA, CWB, SSA and SDU are regional hub candidates and Azul is already in the process of building a mini-hub at CNF. This means quite simply that sometime soon, Azul might have no choice but to replace the E195 with a larger jet on the trunk routes – this of course if the airport infrastructure stays just as it is now – if it is to expand its network. What’s more, the facilities which are to be expanded/built are run in their vast majority by INFRAERO, a state-controlled company. This is a huge problem because they lack expertise, speed-to-the-process and to some extent, the political will. That’s why I feel that a new, larger airplane might present itself as a solution on the trunk-routes (which will undoubtedly grow as they push the regional mini-hubs). Plus, I don’t really think that TAM and Gol will stay put all this time and leave the ‘unserved’ markets all up for grabs. Neeleman is correct when he says that he’s worried with the infra-structure of the smaller airports, but the main airports are also a problem and there are no secondary airport options in Brazil. And yes, Azul is just as present at these airports. David seemed pretty adamant about not wanting a larger airplane right now, but it would seem that he has to at least have an idea in the back of his head about how a larger airplane might fit into the network at some point. I was one of the small number of ATR fans–I think Delta may now regret retiring them, particularly in the ATL-HHH market. It’s certainly one of the nicest props I’ve flown on, though I’ve yet to fly a Q400. One interesting quirk of the ATR, and I wonder if they’ve kept it on the -600 series, is that it has no APU. Instead, the #2 engine can be put into “Hotel mode”, in which the propshaft is disconnected from the turbine. An APU is just a little turbine, as is the “turbo” part of the “turboprop” engine, so you can save a lot of weight by using the latter in place of the former. Just pray the prop brake doesn’t malfunction while you’re walking near the engine! From what I understand, though, the ATR-72-200 maintenance costs were a killer.